Power, riches, codes, exotic destinations, and famous individuals. The members Cahill family don't fully realize the history of their family lineage until the matriarch of their family, Grace, dies. After an unusual reading of her will, they must choose between a million dollars or a dangerous, mysterious race that will send them all across the world to discover the Cahill family secret. The plot centers around orphan siblings, Dan (age 11) and Amy (age 14) as they try to find and decode the 39 clues before their evil, sneaky relatives beat them to it. 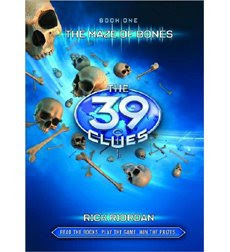 In The 39 Clues: The Maze of Bones - Book 1 they follow messages involving their ancestor Benjamin Franklin, end up in Paris and try to discover the first of many clues. The exciting adventure captivated me and left me wishing I could read the entire series immediately. What kind of secret could make one the most powerful person on the planet? I must admit, I'm intrigued. I've heard many kids find the series just as fascinating. One fellow blogger sent this response via twitter, "My youngest, 13 yo boy loves those books and the game!" What an exciting way to encourage children, both boys and girls, to read. I briefly logged into the online game, but did not get much of a chance to play around yet. The winners of the first episode have been selected but readers can still join and try for subsequent episode prizes. My only complaint: the books include sets of cards that have unique ID numbers for use online. The numbers can only be used one time, so if you have multiple family members that want to play, each will need to get their own set of cards. The Maze of Bones is the first book in the 10-book series. Each book in the series is written by a different author and includes a set of collectible game cards. A prominent figure from history is featured in each book, the first two books involving Benjamin Franklin and Mozart, respectively. Book 3 by Peter Lerangis – The 39 Clues: The Sword Thief – comes out March 3! HUGE GIVEAWAY!!! To celebrate the release of the 3rd book in the series, Scholastic has kindly offered to giveaway (1) Scholastic 39 Clues Prize Pack to a Brimful Curiosities reader. The Prize Pack includes the first 3 books in the series, a 39 Clues Card Pack, and a 39 Clues t-shirt. To enter, visit The Scholastic Store Website and leave a comment here telling me one fact you learned about the 39 Clues series. Welcome to Brimful Curiosities, where every week is a children's book carnival! This review/giveaway is one of my contributions to the Book Giveaway Carnival, (March 2-8, 2009). Head over there for all the great giveaways this week! And don't forget to enter my other giveaways! Wow it sounds like so much fun! "Every kid is a winner - we'll give away prizes through the books, the website and the cards, including a grand prize of $10,000!" I love that the series is going to be so interactive and get kids thinking and researching items. Thanks for the opportunity. Amazing book! It's perfect! Love the concept behind it. my daughter would love this kind of book!! I learned that they are related to tons of people from Harry Houdini to Napoleon. This is such a great book series and my son would jump for joy if I won! Thanks for the opportunity! I learned that they also come in audiobooks. I would love to win this for my granddaughter! Thank you! I leanred that these books are good for children ages 9-12 and that they come in Audio Books! I learned you can buy the cards seperately. This book is really cool my step son would love it. thanks for commenting on my blog! And welcome to Entrecard. It is so much fun...and addictive. We're a great community and I've already made tons of blogging friends. btw, great giveaway for kids! You're obviously a giveaway-pro. I'm currently hosting my very first giveaway ever...you're very welcome to enter! So, cool. The series is everywhere - books card online and there are prizes. You really cannot go wrong. I learned that you can become a long lost member of the Cahill family when you register online to play the game and compete with others! You can read sample chapters of 39 Clues on the Scholastic website. I like that they are show casing influential people in history to inspire learning. It is also cool that the kids can play against their friends. I like that unlike most online extras for things, this one requires them to think...not just watch adverts and stare absently at the screen! This is an easy one for me. I teach middle school reading and Peter Lerangis is the author of Book 3. He is my brother-in-law's (who sadly died suddenly in Oct), Peter is his cousin so we are "kind of" related! I am a follower and would love to have my own set since my kids buy them right and left when I hand out Scholastic book orders! Thanks for a great post and I do love your blog! The clues are hidden around the worldd -- great learning device. I think its cool that you can set up the accounts online for more fun that ties into the book! I learned that kids can set up an online account to challenge other kids, learn secrets, and keep track of their own progress. You can buy the cards separately. I learned we can get the books in audio format. There is a 39 Clues website that allows you to enter to win prizes by playing an online version of 39 clues. Each card pack will contain 1 ultra-rare card. I'm sure my kids will be talking about this soon! This series looks really cool. I learned that there will be 10 adrenaline-charged books, 355 trading cards, and an online game where readers play a part in the story and compete for over $100,000 in prizes. I've heard great things about this one. Thanks for offering it. I learned that you can play along online and with trading cards. I learned that there are over $100,00 in prizes! Talk about incentive to read and learn! I learned the main characters in book 2 are amy and dan. I learned that there are 355 trading cards, and an online game where readers play a part in the story. Sound like alot of fun. I learned that they come in audio books! I was so excited to learn that a different author will be writing each book. How cool is that? Would love a chance at this prize pack. Great Giveaway! It is great that this is the first book of a series and it is interactive. I hope this will attract even more kids to read for pleasure and not because they have to. I loved the first book and I can't wait to read the rest of the series. It reminded me of The Da Vinci Code and National Treasure. I knew a little bit about Benjamin Franklin but I honestly had no clue about some of the things he invented (the armonica thing was really neat too). I like the fact that they are interactive. You can also listen to the audio book version of the 39 Clue Series! I like the fact that they also come in audio books. Thanks for the great giveaway. From the site, I learned that there is also an online game where readers play a part in the story and compete for over $100,000 in prizes. wow! Subscribed via Google Reader, thanks! My nephew has the first book and would love this prize pack, including that T-shirt. He's got a birthday next month and asked for the other books. I'll have to see if he knows about the online game and contest. Added you to my GR, have several nieces and nephews who like to read. I have a teenager (13) and I want her to read more. She writes very well and figures there is no need to read others books. I would like to win this for her. By the way it sounds, these books are a spy type book like Nancy Drew - just add a twist or two. lol Thanks. I learned that Grace Cahill's cat's name is Saladin! What a great name! After reading an excerpt from chapter one of the first book, I'm ready to read them all! Please enter me to win! I learned that "Every kid is a winner - we'll give away prizes through the books, the website and the cards, including a grand prize of $10,000!" This would be great for my cousins! I learned book two is written by Gordon Korman, who I've enjoyed books by. There are 39 clues hidden around the world by the deceased matriarch for the family to find. I am also following you. Hi! Many thanks for introducing me to this amazing series. I have always loved Scholastic books! When I read about this series on their site, I learned that there are 10 books, 355 trading cards and an online game that you can play and win $100,000 in prizes. Many thanks for a delightful giveaway drawing! A great selection of books for kids. Sounds great! The kids would love this! thanks! They come in audiobooks! I love that they come in an audio version. Thank you. I'm already a follower on Twitter (Tasses) and already an RSS subscriber with Google Reader. I actually knew a bit about this title prior to jumping to the Scholastic site, I just hadn't coughed up the $$$ to buy it yet. Awesome! My whole family would love this! The online game allow kids to participate in it. Kids visit the website - www.the39clues.com - and discover they are lost members of the Cahill family. What a great idea mix reading and the computer. Thank you for the giveaway. I have seen this series in the stores and assumed that it was written by Rick Riordan. Now I've learned that each book has a different author. What a fun idea! I learned that there is also an online game that looks fun! I didn't know about the prizes. What a great giveaway. just tweeted and am following you on twitter now. Please include me in your drawing. I am a follower. I learned that Grace is the last matriarch of the Cahills, the world's most powerful family. This would be so great! My grandson would love this! Thank you! i learned that it has an interactive site. My 2 grandsons and their cousins would love it. Sounds fun! My husband actually heard about this series before I did and asked me if my daughter and I had heard of it. I learned that there are also audiobooks for the series. We love audiobooks. I learned that there are also audiobooks geared to the 9-12 year olds. Here is something I learned from the website: "The 39 Clues is Scholastic's groundbreaking new series, spanning 10 adrenaline-charged books, 355 trading cards, and an online game where readers play a part in the story and compete for over $100,000 in prizes." How cool is that! You can purchase the cards separately. I didn't realize that this series was so interactive! I learned on the web site that the kids have cards they can collect and they can play online. I think my stepson would love it! I've tried to get him to enjoy reading, but so far no luck. He does collect Yu-gi-oh cards though, so maybe the card aspect and the online play will pique his interest. I learned that this series has an interactive website that goes with it. It's an interactive book where kids can create an online account and search for clues!!! This is something my son would get into. I learned that each pack contains 16 randomly assorted cards, with at least one rare or ultra-rare card per pack. I think it is neat that you can set up online accounts to compete against others. This looks like a really cool series. I learned that the clues are hidden around the world. My son would love this! Christina - xristya@rock.com - I learned that you can read sample chapters of The 39 Clues on the Scholastic site. Thanks for the GREAT giveaway! They can compete against other kids online. I think that this is nice. My son would love this. The first book was written by Rick Riordan, who writes one of my son's favorite series, the Percy Jackson books (The Lightning Thief). He would love to win The 39 Clues series! These have an online game where readers play a part in the story and compete for over $100,000 in prizes!! WOW! Now that's sweet! I learned that the books are also available in audio format. I lik the act that they can be read in audio cd. That makes it good for those long car rides. I learned that every kid is a winner and that they are giving away prizes through all three ways... the books, the website and the cards. These books would be great for my son. I learned that you can get the books separately or as a set. I learned that not only are the books fun to read, they teach you about famous people in history! I hate history, so this a great series for me to read. Sorry, last time I posted a comment, I didn't give my e-mail. Here it is again. Wow - it has audiobooks, too! A fact learned: The 1st book in the series, The Maze of Bones by Rick Riordan is a New York Times #1 Best seller. This book series looks so fun! I learned that the first book, Maze of Bones, is written by Rick Riordan! I love his Percy Jackson series! I followed you on Twitter and tweeted about the contest. My Twitter name is ParadoxRevealed. I subscribed to your RSS feed on Google Reader. There are going to be ten books and 355 trading cards. Whoa! I am following you on TWITTER....username mamaleahita.